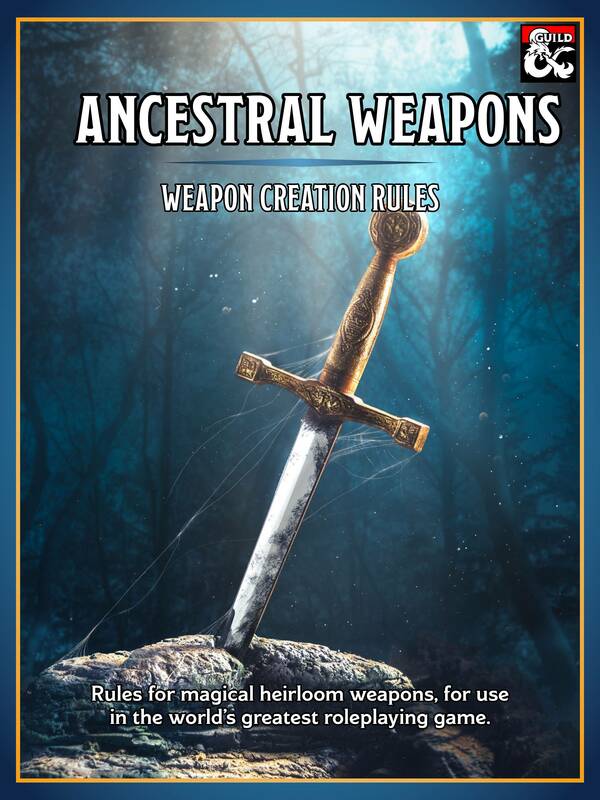 Ancestral Weapons contains rules for scaling heirloom weapons and quick-building magic weapons. A noble blade wielded in the blood wars, an axe used to protect the great city of Mirabar from orc invasions, or a powerful staff passed down by great sorcerers through the aeons. 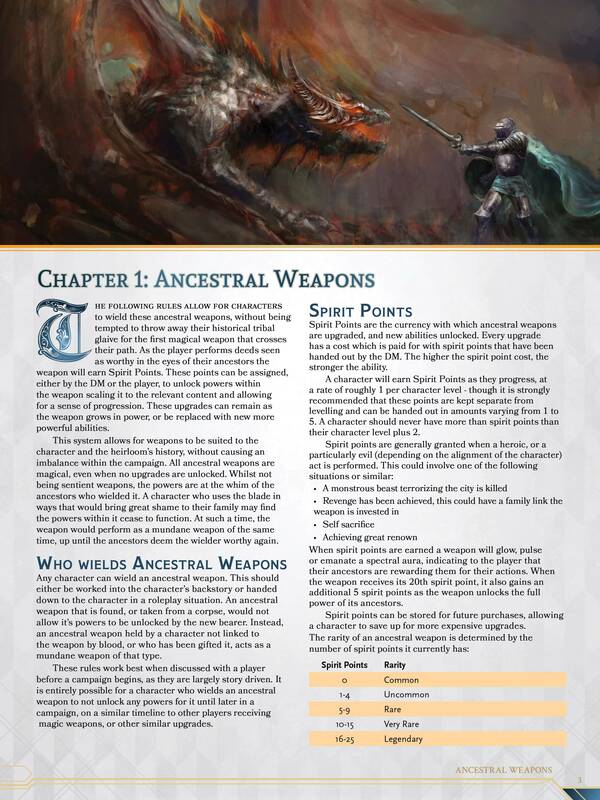 Ancestral Weapons are iconic within roleplaying. These weapons embody a character’s family, story, and history. Ancestral Weapons are powerful heirlooms gifted through the generations that scale up in power as your adventurers perform heroic deeds. As these weapons grow, they unlock new and more powerful upgrades such as inflicting damage caused by the elemental energy trapped inside, causing a foe to flee in fear when struck, or allowing you to deflect even the fiercest of blows. 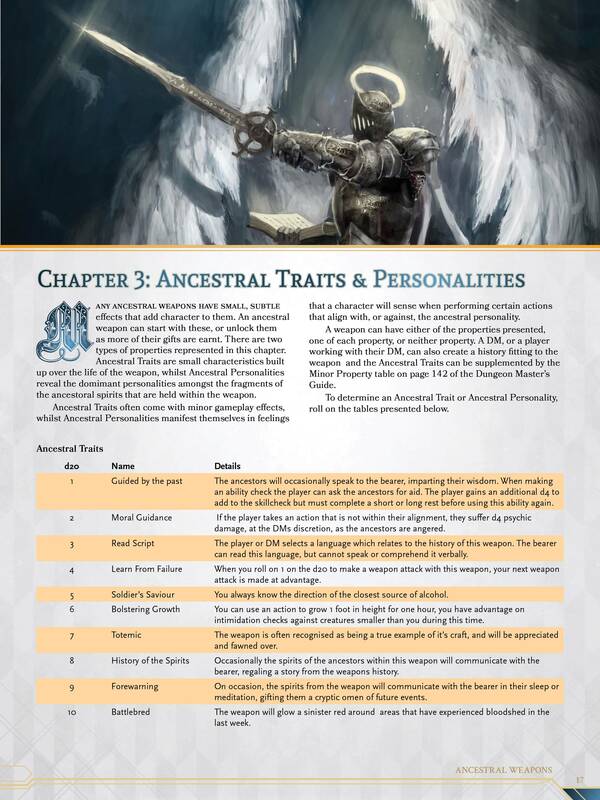 Due to the Spirit Point mechanic used within this system, you can also quickly develop new and thematic magic items to hand out to your players. Players can also use this system to let their heroes forge balanced and fun magic items with the included crafting rules. The product is supplemented by fantastic artwork, with an evocative cover by Fernando Gregory Milan, and heroic chapter art by Kostic Dusan. Ancestral Weapons carry the weight of expectation, physical reminders of generations of epic feats. Can your hero carry the weapon in its next grand chapter? The Perilous Pact - A one-shot adventure set in Waterdeep. Follow a trail of deceit, heartbreak, and devils. I'm excited to use this product, but I have a question about the "duelist" ability. It doesn't say when the +1 AC ends so is it assumed to operate like a shield spell? Hi Alexander. Duelist works "against one melee attack you can see that would hit you.". This AC bonus only lasts for the duration of this single attack (note, not the attack action - just the attack you choose to trigger it against). I love this product! But I have a question about Proficient 4. Should it cost 8 spirit points instead of 4? Hi Andrew, yes it should - I will get this amended in an upcoming version. Our group picked this up just this week and let me just say I LOVE this! I'm a real customization crazy gamer, so it is completely up my alley. I would love if y'all made a sheet to keep with my character sheet to track spirit points and unlocks with a section for backstory. Maybe even a place for art or drawings of our cherished weapons! Loving the book btw, already using it in one of the campaigns I am in. Hi Jakub, great idea. I'll try and pull this together for my next update. Love the product! Quick question. How does leveling up work on an upgrade? enhanced weapon L1 (+1 magic weapon) costs 3 spirit points. Enhanced weapon L2 (+2 weapon) costs six points. To go from L1 to L2 require an additional 3 points or an additional 6? If i'm reading this right, you would use the "overwriting" mechanic to free up the three spirit points from the L1 upgrade, and then spend a total of 6 (net 3) to get the L2 upgrade. Exactly this, you overwrite the original upgrade to the new upgrade, effectively paying the difference. can you make ancestral armor ? This prodcut is great. We are looking at other products in this series in the future - keep your eyes out for an announcement in the coming weeks! I'm interested in this product, but I'd love to have a Fantasy Grounds module rather than the PDF. Is that in the works already? If not, I'd be interested in doing the work for a conversion. You can contact me by e-mail ajwk@reborn.com or Discord VeX#8197 if you're interested. LIke it, i proposed this for my Pact Weapon for my Hexblade, and the DM was interested in it. The rp is that its the Blade of my patron but that it broke and fragments are scattered through the plane. -There's a 25% chances that a Boss as a fragement on him, either as a trinket or amulet or on his weapon, and thus can use One/Two of the Ancestral weapon upgrades during the encounter, once defeated, i take the fragement back and get 5Sp. -There's a 10% chances that we encounter an "Elite" monster, that also has a fragement in his possession, wich makes him stronger (One upgrade) and give 3Sp when killed. Hello, my group is enjoying your product very much..I do have a question about the upgrade "Precise" it reads "You can reroll damage results of 1 from this weapon, you must accept the second result" so my question is, does this affect rolls of 1 on all dice or just the weapon die? For example, im playing a hexblade warlock/rogue, at 6th lvl i have 1d6 sneak attack, 1d6 hex spell, the weapon also does 1d6 to evil on top of the 1d8 weapon damage. Thanks. Hi Jay, this is for all damage from the weapon. In this situation, this would apply to the additional damage too. Hey, Dungeon R, was just in time. Playing tonight..thanks much for the clarity. Just purchased because this very much reminds me of Weapons of Legacy from 3.5e. Great job on the content and format from what I see. Is it possible to get a bookmarked version of this document in the future and/or a hyperlinked Contents for page 1? Thanks Joseph! I'll have a look into this and see if I can add it into a future update. 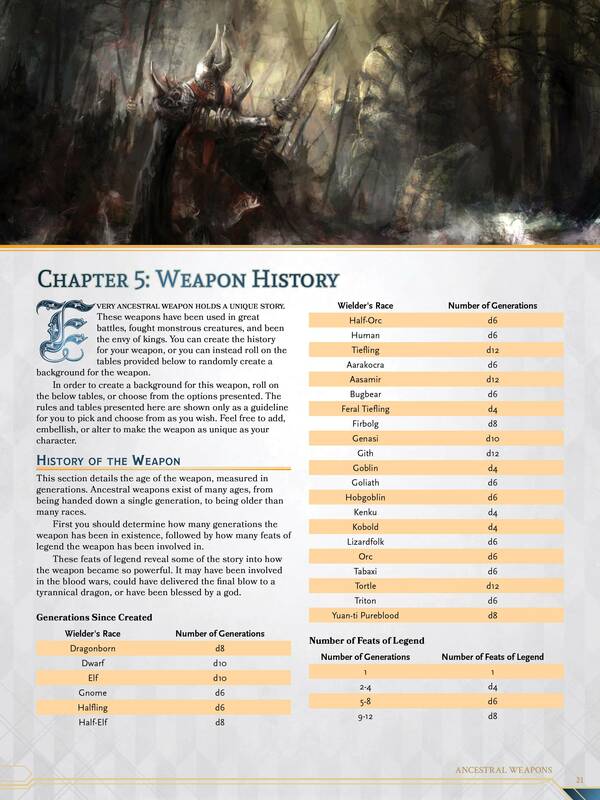 Hello, love the product thus far, but there is a typo on the Random Table regarding Feats of Legend for the Ancestral Weapons. One of them says "This weapon bought a city to ruin," but I think you mean "This weapon brought a city to ruin" I cannot wait to make a bunch of fun, powerful weapons to have in my DnD game for NPCs and players. Hi Cody, glad you are enjoying it, and thanks - will get this amended in v1.2! I love this idea but was wondering how hard/easy this would be to implement in DnDBeyond? I ask because my groups rely heavily on that service so I would have to be able to recreate these items in there. Hey Wayne. You'd need to make the items manually. You can do this as a homebrew item (which I think you can edit) each time it earns new upgrades. It's not a lot of work and keeps them all there nicely. That's what I thought and I agree, it's not too bad a process. You just got yourself a sale. :-) Thanks for the speedy answer! I am planning to allow this supplement for a hexblade player of my DnD 5e group. However a rules question has come up. Page 7, Skill Magus (level 1): You mention here a "+2 to spell attack and +2 to AC". Is this a typo and you meant "+2 to spell attack and +2 to spell save DC"? A +2 AC seems a bit too strong considering its a permanent +2, while Duelist (level 1) only gives a temporary +1 AC bonus and only at the cost of the players reaction. Would be awesome if you could clarify if this is a typo or not, and in case it isn't, explain your reasoning behind this choice. Otherwise your supplement looks great. Looking forward to how it will play out in my campaign! This is a typo on v1.1 that has happened in updating it. Magus (level 1) should read: Whilst holding this weapon you have a +1 bonus to spell attack rolls and a +1 bonus to AC. Each level in Magus increases each of these values by 1 (Magus level 2 is 2 to spell attack and 2 to AC etc). Annoyingly when rewriting this from 1.0 to 1.1 I managed to make a different error!! This will be updated in v1.2 soon. 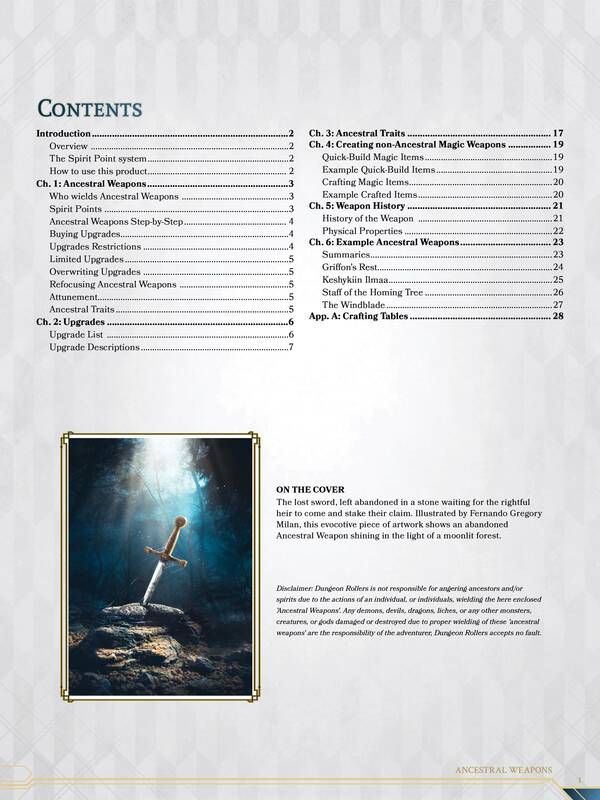 This is an incredibly well thought-out supplement that would be ideal to use in games where you don't want to bother with standard magic items, and instead give players a signature weapon that carries significance to their characters. There is potential here for players to bond so much with their weapon that DMs won't even need to worry about other magic item rewards. It is a very cool concept, but I must admit that I have tried a similar version of this in my own games before and it back-fired. Players started to expect too much too quickly, and were not sufficiently patient for the upgrades. It incentivizes a certain type of game-play that I'm not comfortable with ("Hey, DM, pretty heroic deed wasn't it? Who else needs saving? No rest, no downtime, must get spirit points!! arghh!! Why are you guys sitting around?!?! we need to level up!"). This is kind of my beef with the Inspiration...See more system as well, where I've experienced many players saying "Hey, I just roleplayed my flaw, where's my inspiration? Oh you want jokes? I got jokes...I can go all day long!" You might be thinking "but it's the DM's call"...sure, but when a player READS that there IS a process to something, there's only so many times you can remind them whose in charge before they start to not be as invested in it. Which brings me to points 2: I'm not confident in presenting the full set of upgrades to my players as not all of them have gone through sufficient balance checks (a longer discussion, but irrelevant right now). 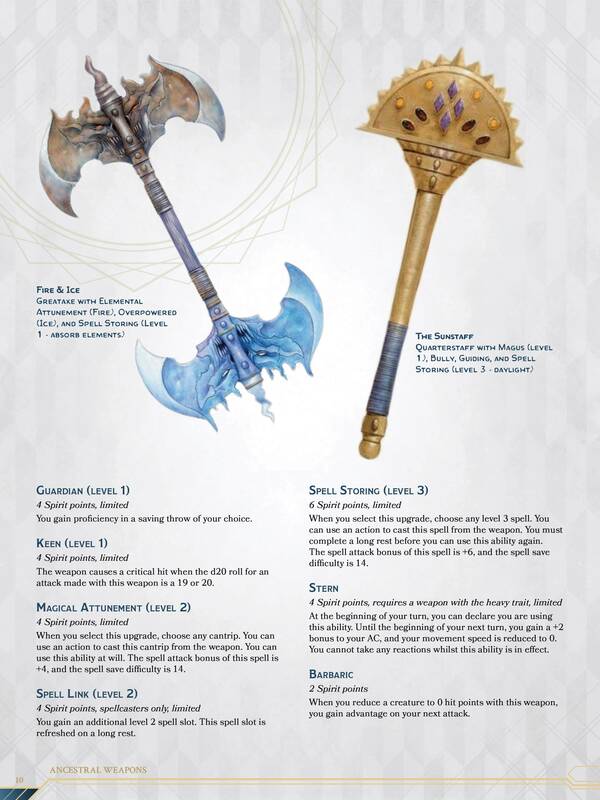 While there is the option for the DM to choose what upgrades players receive, this could just whittle away player enthusiasm/patience for ancestral weapons upgrades relative to normal magic items (which are available in a core book). So it's a double-edged sword (no pun intended). I will still give it a shot with other groups I play with. I also stand by the 5-star rating because I think it IS a good supplement for a socioemotionally competent Dungeons and Dragons group, or one with an experienced, respected, and highly competent DM. Its a problem with the players mindset, not the systeme per se, nothing much that can be done about it. Maybe vary the sources of spirit points and give them a bit more on certain occasions so that they progression feel smooth enough, but not too good. Yes, absolutely. I think there's a certain finesse people can use to present this to players which can avert such a situation. Varying sources of spirit point awarding is simple enough, and probably shouldn't have warranted a long, rambling discussion post from me. I apologize...can't delete the previous post for some reason, but will edit my written review. I think this a very interesting concept and I will love to try this out in my game! For a side note, do the upgrades and system work well with armour or defensive equipment or accessories? Hi Sean, although the system is designed to be used with all types of items (we may or may not have plans for this...), some of the upgrades will work for sure. However they weren't designed with Armor in mind and as such may end up feeling mechanically or thematically odd, so would require some 'common sense' to prevail on behalf of those using it. For example, "Armor of the Plaguedoctor" with Poisonward, Guardian (level 1 - constitution), and Bolstering would work fine both thematically and mechanically.